The Voyager 1 Spacecraft, launched in 1977, is nearing a departure from our solar system. I’m adding this list to A Collection Of “The Best…” Lists On Space. Clearly, NASA’s official page for Voyager 1 is the very best source for multimedia resources. NASA’s interactive on the contents of the “Golden Record” carried by Voyager for other intelligent life to see and listen to is my favorite part of that site. Humanity escapes the solar system: Voyager 1 signals that it has reached the edge of interstellar space – 11 billion miles away is from The Mail Online. Graphic: Voyager 1 space probe exits the solar system is from The National Post. The BBC has a special page on Voyager 1. NASA Voyager 1 spacecraft nears interstellar space is from Fox News. Voyager space probe reaches edge of solar system is from Reuters. Voyager 1 Bids Farewell to the Solar System is from NPR. Voyager’s Long Journey: 35 Years of Incredible Solar System Images is from Wired. Voyager 1 Turns 35, Will Soon Be the First Man-Made Object to Leave the Solar System is from The Atlantic. Voyager: a space odyssey – in pictures is from The Guardian. Voyager’s epic journey: How long would it take you? is a neat interactive from The BBC. Going, Going, Still Going? Voyager 1 at Solar System’s Edge is from The New York Times. NASA’s Voyager 1 Explores Final Frontier of Our ‘Solar Bubble’ is from NASA. The Atlantic shares what Voyager heard as it left our solar system. Exiting the Solar System and Fulfilling a Dream is from The New York Times and includes a lot of multimedia features. 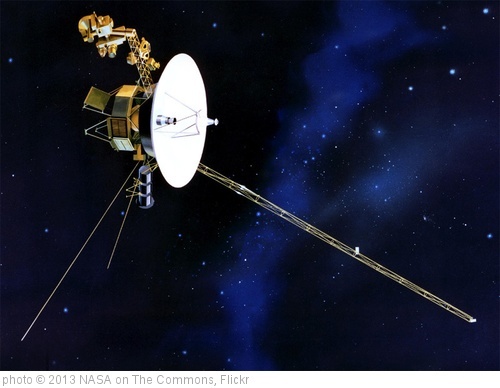 Voyager 1 becomes first human-made object to leave solar system is from CNN. Voyager 1 finally crosses into interstellar space is from CBS News. Voyagers from Santiago Menghini on Vimeo. Voyager’s 40th Anniversary is a photo gallery from The Atlantic. Great Lesson Idea – What Would You Put On Voyager’s “Golden Record”?